How well does life roll on for the Pearsons in the second season of the This Is Us TV show on NBC? As we all know, the Nielsen ratings typically play a big role in determining whether a TV show like This Is Us is cancelled or renewed for a third season. Unfortunately, most of us do not live in Nielsen households. Because many viewers feel frustrated when their viewing habits and opinions aren’t considered, we’d like to offer you the chance to rate all the season two episodes of This Is Us for us here. An NBC family dramedy, This Is Us stars Milo Ventimiglia, Mandy Moore, Chrissy Metz, Justin Hartley, Chris Sullivan, Susan Kelechi Watson, Jon Huertas, Alexandra Breckenridge, Hannah Zeile, Niles Fitch, Logan Shroyer, Mackenzie Hancsicsak, Parker Bates, Faithe Herman, and Eris Baker. The TV series follows three people who were born on the same day and explores their connection, the meaning of family, and the nature of love. What do you think? Which season two episodes of the This Is Us TV series do you rate as wonderful, terrible, or somewhere between? Are you happy NBC has renewed This Is Us for season three? Don’t forget to vote, and share your thoughts, below. More about: This Is Us, This Is Us: canceled or renewed? 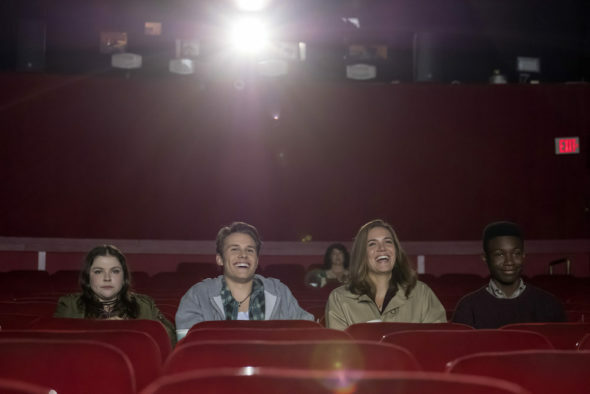 This Is Us: Cancelled or Renewed for Season Three on NBC? This Is Us: When Will the NBC TV Show Return? This is a fantastic show! It’s loved by all who watch it. I noticed if there is just one mention of this show on any social network, it goes viral! Everyone has to post a comment on how they love this show. I hope it doesn’t get cancelled. Best drama on tv! Phenomenal cast! THIS IS A FANTASTIC SHOW, VERY HEARTWARMING AND LOVING!!! PLEASE DO NOT CANCEL!!! Everything about this show is so well done. There’s literally only been 1 episode, where a tear hasn’t come down my face, and i’m not one to cry very often. I hope that it stays a quality tv show, for many more years to come. Love love love this show!! definitely one of the best shows i’ve ever seen. i’d be hugely disappointed if it were cancelled. I love this show!!!! RENEW IT!!!! This is the most original tv series that has been presented on television in a very long time. Do not mess with this show, it is freaking awesome and I hope the story of these great characters goes on for years! !